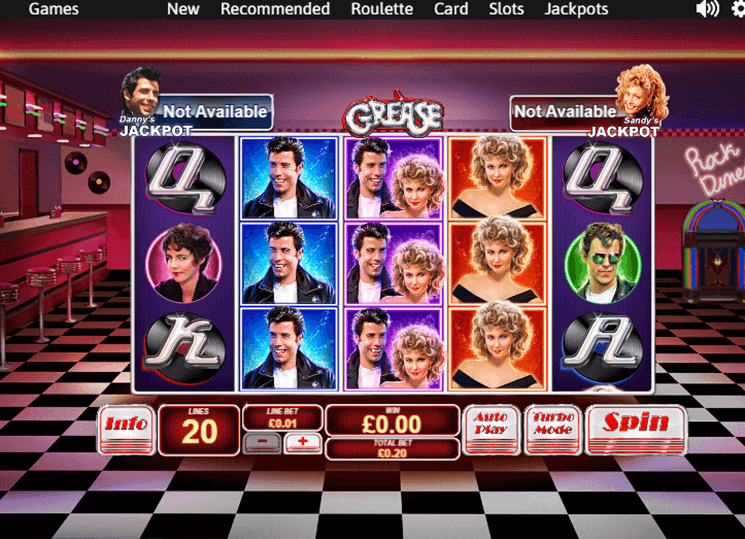 Grease Slot is a 5 reel and 20 paylines, progressive jackpot video slot, powered by PlayTech software platform. Video slot takes its inspiration from 1978 classic movie “Grease”. Design of the slot have old school 70’s feel, graphics are cartoon-ish and high quality. Low value symbols are vinyl themed playing cards – which ranges from “J” to “A”. Medium and high value symbols are film characters Betty Rizzo, Kenickie Murdoch, Sandy Olsson and Danny Zuko as well as cars and milkshakes. In addition, Scatter and Wild symbols are available as well. Before investing real money players can try Grease Slot for free, or visit any PlayTech Casino such as: SlotsMillion Casino, PlayFortuna Casino and others to play with real money and win. Besides Wild and Scatter symbols you also have a joined Danny and Sandy symbol. Being a Jackpot progressive video slot, Grease is loaded with different features. One of the first features you will find is a “Rockin’ and a Rollin’ Respins feature”. To activate this feature Danny and Sandy, individually or joined need to cover 1st reel fully. When the feature is triggered you will be awarded with 3 re-spins. Feature can be re-activated during re-spins. Sweetheart Wild Symbols feature triggers randomly during main game. Up to 8 additional Wilds will land on the reels, awarding you big wins. When you land 3 Scatter symbols on the 1st, 3rd and 5th reels you will activate 3 different bonus games. Nice thing that during the bonus game you can choose which feature to choose. Better Shape Up Free Games feature – will give you 12 free spins with only high value symbols on the reels. Summer Nights Free Games feature – Sweetheart Wild Symbols feature will be activated with 4 free spins on top of it. Rydell High Bonus feature – you will presented with the option to pick photos from high school yearbook in exchange for cash prizes.